One of my goals for the year is to finally make a new bed quilt for The Mister and me. 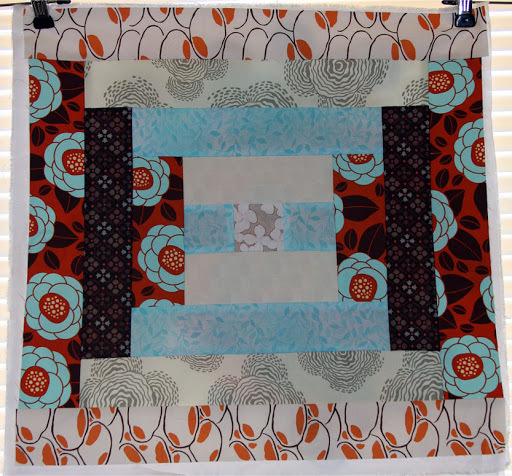 I originally planned to make a pattern out of Material Obsession and fell in love with “Retro Starburst.” (Anyone who knows me well enough to know of my love affair with mid-century modern–starbursts in particular–should not be surprised by this.) This was about 3 years ago, back in the days before I knew about popular (out of print) quilting fabric lines, and little did I know, I fell in love with one in that pattern. After correspondence with the author of the book (who owns a quilt shop in Australia by the same name), I was informed of the name of my material obsession (oh kittens, I can’t help myself sometimes): Flea Market Fancy by Denise Schmidt. This would be the place to cue the Audience Groan. I’m no stranger to hard-to-find, hard-to-buy objects, but FMF was too much for me. I tried to find it everywhere. Random Google searches. Etsy. Ebay. Over the course of three years, I’ve managed to purchase some of the less desirable fabrics, and even lucked out in a score of the large scale, blue and red floral, but I was never able to get all of the line I would have liked. I became bitter and decided to move on, dumping the pattern after a substitute line didn’t strike my fancy as I had hoped. (Deer Valley (in azure) by Joel Dewberry, if anyone is curious. The colors were just too subdued and while pretty, I really wanted the vibrant colors of the FMF.) I dumped it even though I had gone through the pains of purchasing some of the Prints Charming starburst blocks from Material Obsession and having them shipped here. So I tried to work with Deer Valley and could never seem to find the right pattern for it. Eventually, I started purchasing random fabrics I thought would coordinate, but almost always, they just didn’t. It really is a hard line to match, except with other Dewberry lines and SURPRISE! Those are popular and hard to find as well. While my mother was visiting in July and August, I decided to give Unfurnished a whirl. Sadly, it’s poorly written and gave me a hard time. Shockingly, it also gave my mother, who is a veteran sewer and quilter, a headache trying to figure it out. After a good day of trying to make sense of the directions, she helped me alter the size and we got the fabric prepped to go. As soon as she left, my enthusiasm for the project went that way as well. It just wasn’t…right. So I packed up the fabric and my machine. I wallowed in my sewing angst for awhile. Then two nights ago, I was up late and decided I was going to pick a pattern and get working on it. What did I decide on? Retro Starburst. Why did I ever deviate from this? So now I’ve prepped more fabric and pieced together the first block. I’m rather happy with it. Since it is rotary cut, the book has it set up to mass produce and sew together, but I’m not as confident with sewing and quilting as I am with knitting. So I decided to take this slow and after each fabric addition, I’ve placed the block next to every fabric I have and hand-picked the next one to be sewn on. It took about 3 hours to get this all cut, sewn and pressed. Not too bad, considering it’s a little bigger then 18.5″ square. The first block contains a few lines that I’m not sure who designed them, but there’s a little FMF in there, some Amy Butler, and some Joel Dewberry. Here’s to the next block! Love it! Can't wait to see more!